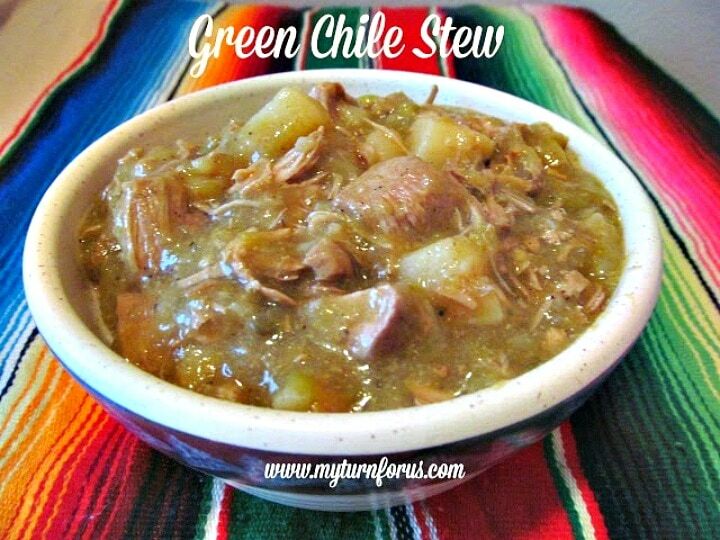 This Hatch Green Chile Pork Slow Cooker Stew is delicious with fresh green chiles. And it just warms the heart and soul with spicy comfort. 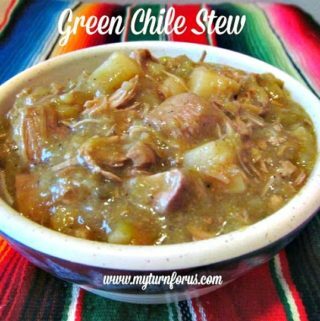 It’s a Green Chile Pork Stew that’s loaded with Hatch Green chiles, pork, potatoes, and spices. Which makes it a great bowl of comfort to warm the soul. One thing that I miss about New Mexico is the abundance of fresh green chiles We lived near Hatch New Mexico and reaped the benefit of fresh Hatch Green Chiles every fall. 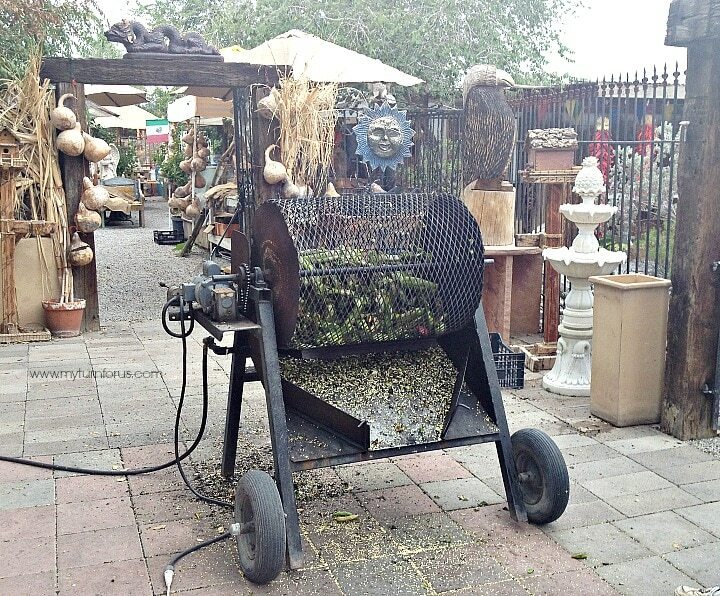 I absolutely love the smell of roasting green chile and most of the New Mexico air is just alive with the aroma during harvest season. We would buy a gunny sack full of fresh green chiles and have them roasted on the spot. These chile roasters are all over town during harvest, even at Walmart and our local grocery stores. 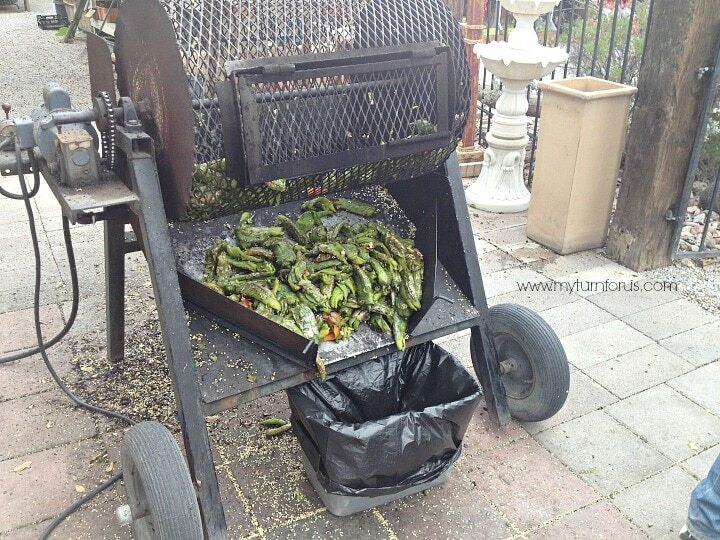 They place the fresh chiles into the drum of the roaster and a burner is lite. The roaster drum tumbles the chiles past the open flame. When the chiles are roasted, the flame is turned off and the drum continues to turn so most of the seeds and skins fall off. We pack them in a big trash bag to take home to separate and freeze. The aroma is heavenly and just hangs over the entire area. Roasted Green Chiles is one of my all time favorite smells. We separate our fresh chiles and freeze them with our Foodsaver Vacuum Sealer. 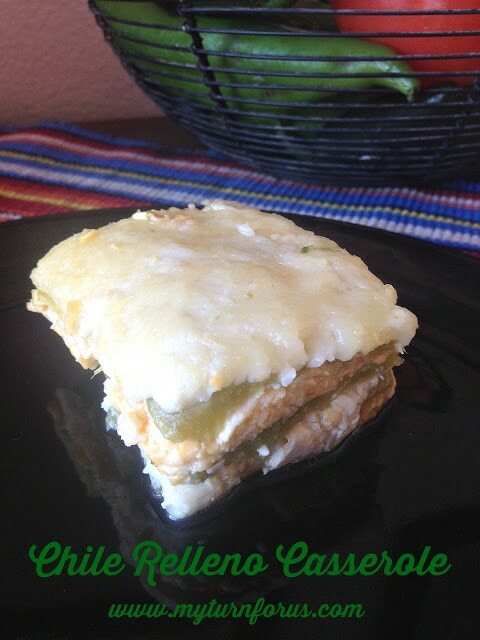 This way we have fresh green chiles in our freezer all year. Chunks of pork, potato and green chile in a seasoned Mexican green sauce. Season pork cubes with salt and pepper and brown in a large dutch oven with the olive oil over medium-high heat until brown in batches. Remove the pork cubes and allow to drain on paper towels. Add chopped onions in the dutch oven and cook until soft and translucent about 5-6 minutes. Add green chiles, garlic, cumin, oregano and cook for 1minute. Add vinegar and stir to deglaze the pan, pour in the enchilada sauce and chicken broth, heat. Place pork cubes in a slow cooker, pour the sauce from the Dutch oven over the pork, add the potatoes and cook for 3-4 hours on low. Pork will be tender and the sauce will be thickened. Yum, yum! I got the first green chile wiff at Albertson's this weekend! What a great time of year! Honestly, I've always been kinda jealous of New Mexicans and their roasted chiles! My opinion is that roasting is just about the best thing that can be done to chiles. 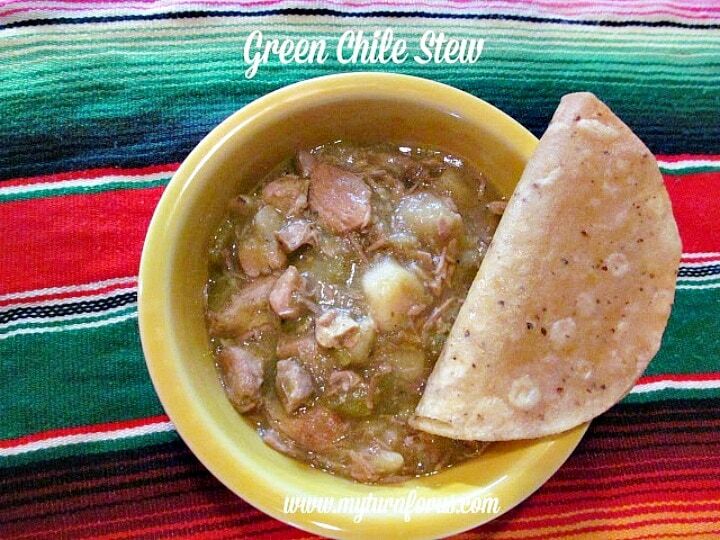 I've never had green chile stew…looks yummy! This is our kind of stew, we would love your Green Chile Stew! 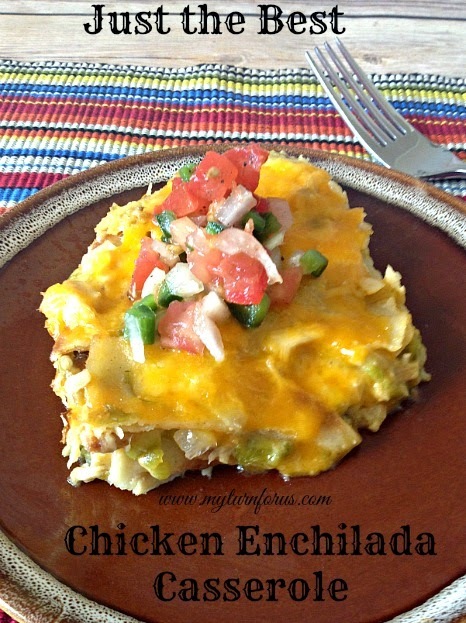 Thanks so much for sharing your awesome recipe with us at Full Plate Thursday this week. Hope you have a fantastic day and come back real soon! I love Green Chile Stew! This will be a wonderful meal for those cold winter nights! Yum! Thanks for linking to the In and Out of the Kitchen party. Your stew was the most viewed post from last week. I bet this would be so warming on a cold night!! What size and type of potatoes do you use? The only thing I would change is to cook it on high for 4 to 5 hours so that the meat will be tender I did and it was great.